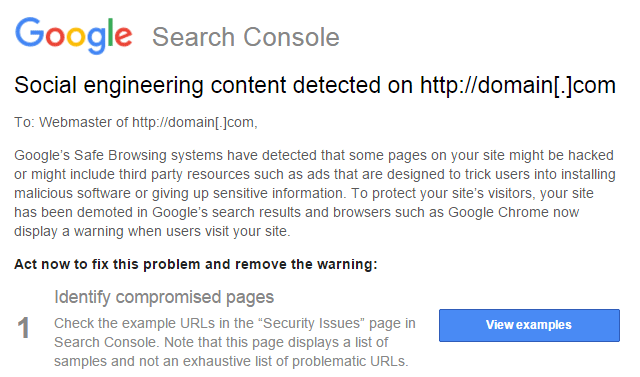 Google is now sending out notifications for "Social engineering content detected" on your web site and sometimes it looks like the notifications are not valid. This is part of Google's warning about deceptive download buttons and now Google is sending out notifications about this to webmasters that match their criteria. There are plenty of people in Google Webmaster Help also reporting getting them. One said that it was a mistake, that the deceptive download button is not deceptive but rather intentional. The thing is after people read the menu. We put a call to action button for them to go to the order page. On the order page, it is embeded iframe linking to our ordering platform on Gloriafood. Will this possible for Google bot considering our page as phishing / deception site? So they submitted a reconsideration request, linked to the thread and Google reversed it. The webmaster added, "I hope that Google will adjust their crawler to prevent this false detection in the future." Forum discussion at Google Webmaster Help & Reddit.